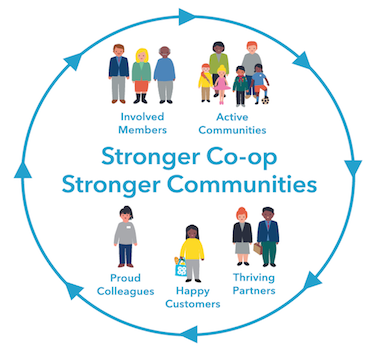 The Co-op is one of the world’s largest consumer co-operatives, with over 4.6 million members. Its purpose is ‘Championing a better way of doing business for you and your communities’. Today the Co-op announces the launch of its 12th annual sustainability report. The 2017 Report details how the Co-op’s approach to sustainability is supported by its campaigning agenda, and how its activities link to the UN’s Sustainable Development Goals (SDGs). For the first time the Co-op reports on the social impact generated in communities through a series of independently authored case studies that will help shape its thinking in this evolving area. Looking ahead, the report sets out targets and identifies emerging themes for the coming years. These will support the Co-op’s ambition to build a ‘Stronger Co-op and Stronger Communities’, and include: making progress to better understand the social value the business generates, further aligning material activities to the SDGs, and promoting more grass roots co-operation to campaign for change. The Report is independently assured by DNV GL.